Just south of the border, on the Baja Peninsula, lies the flourishing, friendly port and holiday destination of Ensenada. It's a 90-minute drive south of San Diego and joined to Tijuana by the spectacular Trans-Peninsula Highway, with its breathtaking ocean views. The first visitor to this beautiful bay was Spanish explorer Sebastian Vizcaino, who set ashore in 1602 and named the spot Ensenada de Todos los Santos, which means 'inlet of all the saints'. The saints have indeed been kind to Ensenada, which today has progressed from a Spanish mission station through fishing village status to become Mexico's second-most visited port of call for cruise liners and yachts, an extremely popular holiday destination for land-based tourists, and a leading convention centre. The secret of Ensenada's success as a tourist magnet is simple: the resort town basically has it all. The weather is bright and sunny throughout the year, and the Pacific beaches are magnificent. These basic ingredients have been enhanced by some wonderful natural and man-made attractions, great restaurants serving up fresh seafood and local wines, and amiable local tour operators providing a huge array of outdoor recreational activities and excursions. Even the town's industry, which consists mainly of fishing, winemaking and canning, has become a lure for visitors, who can visit factories and wineries and liberally sample the delicious wares. The eyes of avid bargain-hunting tourists glitter when they see Ensenada's broad shopping avenues. The shops are literally bursting with a massive array of Mexican arts and crafts from elegant Taxco silver jewellery in the boutiques of the Avenida Lopez Mateos to a selection of 'below $5' curios in the stores along First Street. Best buys to look out for in Ensenada are leather goods (bags, purses, jackets, belts etc. ), hand-blown glassware, woodcarvings, and ceramics. Those who enjoy local colour can browse through the bustling Los Globos flea market where occasional treasures can be found. Due to its popularity as a cruise port, Ensenada offers great shopping opportunities, but it can be very expensive. No matter what your taste in food, from hamburgers to haute cuisine, you will find it while on holiday in Ensenada. However, because of its seaside location and local fishing industry, nearly all restaurants offer some sort of fresh seafood on the menu, and most include traditional Mexican fare. Highly recommended is a visit to the fish market (known as the 'Black Market') where delicious and cheap fish tacos are sold at several stands. Lunches are best enjoyed at one of the myriad sidewalk cafes: relax and watch the passing parade of people along a leafy boulevard while sipping a glass of wine. When it comes to dining, the choice is vast. Manzanilla in the port area is a great place to try local cuisine. Those hankering for formal dining can enjoy award-winning French cuisine at El Rey Sol on Avenue Lopez Mateos. For a taste of the traditional, fun comes along with the food at Bronco's Steakhouse, which serves a great Mexican buffet at weekends. 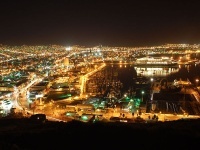 Holidaymakers will enjoy the nightlife in Ensenada, which sizzles after dark, especially during weekends, with discos, karaoke bars and cantinas rollicking into the early hours. An unmissable night spot is Baja's oldest cantina, Hussongs, which was established in 1892 as a stage coach stop and is still partying today in traditional Mexican style. Tourists should spend at least a few hours at Hussongs, swigging margaritas as mariachis stroll the sawdust-strewn, rough wood floors. When it comes to sightseeing the most popular spots are the town's showpiece 'Riviera' centre, originally a casino owned by renowned boxer Jack Dempsey in the 1930s and now restored as the cultural and social centre of Ensenada; the Bodegas de Santo Tomas winery, where tastings and tours are offered at its downtown premises; the Malecon (waterfront promenade) where sea lions congregate; and the Ventana al Mar Park with its massive Mexican flag. There are also several small museums. Close to downtown there are some small, pleasant beaches, and along the adjacent coast some of the best beaches on the Baja Peninsula can to be enjoyed, offering a huge variety of recreational facilities from surfing and sailing to jet-skiing and scuba diving. Horse riding on the beach is very popular. Trips out of town include visits to La Bufadora, an amazing ocean blowhole, which shoots water dozens of feet into the air. Whale watching trips are also a great option. In addition, Ensenada has a packed events calendar, including the famous Baja 1,000 off-road races, regattas, cycling events, a seafood fair and the annual Mexican Mardis Gras. Being something of a tourist Mecca, Ensenada tends to be more expensive than other towns in Mexico.